The Orchard «La Kol·lectiva» looks for the empowerment through the recovery of the land and the creation of an economic and auto-employing system. The project is born for achieving of vegetables and medicinal plants in social currency, and we cooperate with other collectivized projects inside the Cooperativa Integral Valenciana. We are collaborating with the FairCoop País Valencià Local Node, and some of us are using this cryptocurrency in our transactions with CIC. We actuall share, no only the FairCoop principles of Integral Revolution, P2P Collaboration and Hacker Ethics, but also cooperation, self-organization, solidarity and transparency. We intend to invest our FairCoins purchasing products through the network of collectives and individuals that work for a new economy based on cooperation and proximity. 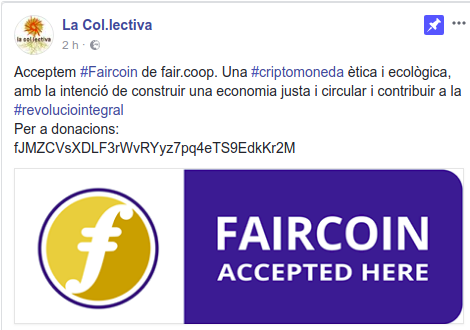 As La Kol·lectiva we have not bought anything yet, but on a particular level, many of us have already used FairCoin in our achievements. I saw you added the social network post, great.